Home canning can be a safe, economical way to preserve quality food at home. When I was a little girl, I spent hours on my Grandmother's porch shelling field peas and butter beans. I really hating doing that. She had a garden that was almost a half acre, and we not only had to pick the vegetables, but all of us kids had to shell them as well. After we were done shelling about 50 bushels of peas, the next step was the part that I loved. We would spend days in the kitchen canning all of those peas. As I grew up, we moved away from near my grandmother, and I no longer could spend those long summer days in her kitchen or on her front porch, but they are some of my favorite memories. About 10 years ago, I got the wild idea to try canning again, after finding a pressure canner in a catalog. I bought two and I have been canning and collecting recipes ever since. 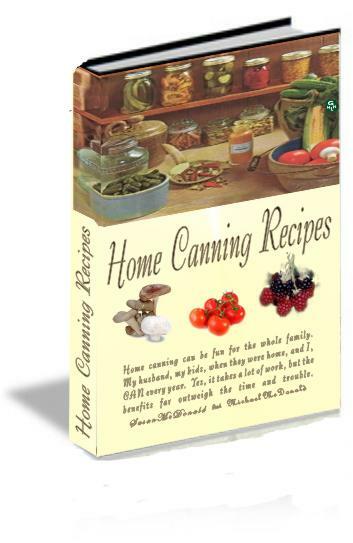 In fact I wrote an E Book with 120 home canning recipes. 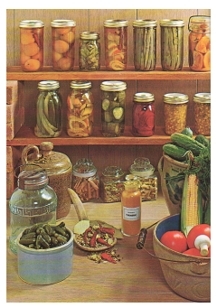 It has, along with a history of home canning, beautiful graphics, and it includes recipes for everything from Apple Butter, to Zucchini. It is a must have if you are serious about home canning, or if you just want to learn about the history of home canning and to have the great graphics. You can order the Kindle EBook at the bottom of this page. I also want to note that I do not have a garden. I live in Florida, and the bugs get my plants every year so I gave up. I buy most of my vegetables and fruits from farmer's markets. Out of season, I go to BJ's and buy my tomatoes and sauce in gallon cans, and use that to make my pasta sauces. Every year at Christmas my husband and I can about 75 quarts of spaghetti sauce and give them out as gifts. All of my friends and family look forward to it. We make Marinara,(no meat), sausage and mushroom, white clam sauce, and red clam sauce. I keep the Marinara for myself and use it for cooking during the year. One thing that is important to remember and to take into consideration when home canning is your altitude. If you live above 1000 feet you must adjust your processing times accordingly. Failure to lengthen the processing times may result in short term shelf life, or spoiled food due to the growth of mold and bacteria and other microorganisms not detected by sight or smell. Food poisoning may result if the spoiled food is eaten. See the chart below for guidelines. Canned food can be safely stored for one year at room temperature. After you can, label each jar with the contents and the use by date (1 year from the date of canning). Believe me, this is a very important step, in order to keep track of the items canned. My husband gets diskette labels from a local office supply store. On them he prints out the contents, and the use by date on each label. This type of label works great because they are very easy to peel off, so the jars can be reused. There are three basic methods of canning and preserving. They are, the steam pressure, water bath, and open kettle method. The particular method used depends on the food to be processed. The steam pressure method requires special equipment; most kitchens are already equipped with the utensils needed in the other two methods. Always use one of these three methods. Avoid short cuts, as they can be dangerous and will not produce safe, canned food. Disregard the value of your time, canning homegrown or locally produced food can save you half of the cost of purchased canned food. Canning favorite and special products to be enjoyed by your friends and family can be very rewarding. Home canning has changed greatly in the 170 odd years since it was first introduced. New developments in technology have resulted in safer, higher quality products. Home canning is a great way to take advantage of summer's bounty, and preserve all of those fresh vegetables and fruits. I would invest in a good quality pressure canner. You will need this to can low acid foods like vegetables, and meats. It can also be used as a water bath canner. If you do a Google search for pressure canners, you will find hundreds for sale. 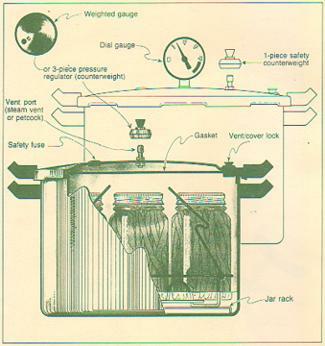 I would advise that you purchase a 16-17 quart canner with a good pressure gauge, and petlock. See the diagram above to see what to look for. Use only standard Mason, Kerr or Ball type canning jars and two piece self-sealing lids. Mayonnaise jars are not recommended for canning. Canning jars are available in a variety of sizes including 1/2 pints, pints, and quarts. Pint and quart jars are most commonly used, but some foods like crab meat and mushrooms should only be canned in 1/2 pint jars. 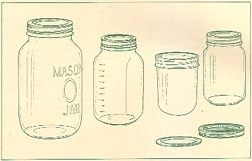 Wide mouth jars are more easily filled and emptied, but they cost more than standard jars. You will also need a good timer,an open mouth funnel, to fill jars with, a jar lifter, and tongs. And of course pot holders and baking racks or towels to set the hot jars on after canning. Other items that you will need are, a ladle with a lip, a sieve, a colander, a food mill, and sharp knives. Some of these items you will only need if making jams and jellies. Canning can be one of the most enjoyable experiences that you will ever have. Get the whole family involved. It will make many great, lasting memories that your family will always have. You'll find pleasure in the canning process, and pride in your home canned jars of food. Remember, they also make great gifts! If you are interested in growing your own vegetables to can click on the link below for some great tips on home gardening.